You don’t have to be miserable, because SCIENCE! 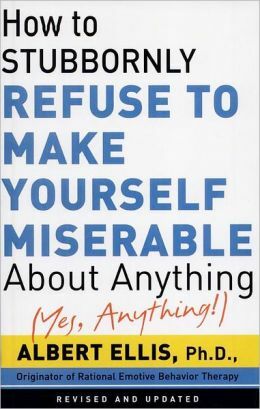 Book Review: “How to Stubbornly Refuse to Make Yourself Miserable About Anything – Yes, Anything!” by Albert Ellis, Ph. D.
Well if that’s not a catchy title, I don’t know what is! I found this gem one day while researching cognitive psychology online. I lit up with excitement because, when studying for my Bachelor’s degree in psychology, cognitive-behavioral therapy was one of my favorite topics to study. In fact, the author of this book, Albert Ellis, is pretty much considered the “father” of cognitive-behavioral therapies. Way back in 1955, he developed what is known as Rational Emotive Behavior Therapy (REBT). Okay, okay, so this is getting dry and boring already, I get it! However, when you take a peek behind all the jargon, you get a remarkably fresh, exciting, and most importantly – easy to implement – way to deal with any kind of misery or emotional upset. Delving into REBT could take months of intense study, however, Ellis knows how to get the prime bits delivered in a quick, no-nonsense style. Unconditional Self-Acceptance (rather than conditional self-esteem). It is made very clear in the book that Ellis does not advocate a “Pollyannish” positive-thinking-all-the-damn-time-no-matter-what-even-if-it-kills-me type attitude. Far from that. I recommend actually reading the introduction to this book. I usually skip them to get to the “good parts.” But in this book, every part is good! Ellis takes the reader through an explanation of how his book differs from other self-help books, then proceeds to teach you how to approach life conditions scientifically. I don’t like that word, “scientifically” – it makes me think, oh good grief – I’m going to fall asleep now. However, Ellis makes it easy for us, the dear readers. He writes in an engaging and very often humorous style that is easy to digest. The book then goes on to detail 14 REBT “insights” – chapters that give you tons of ammo to deal with pretty much any problem you can think of. To wrap it all up, there is an appendix entitled “The Biological Basis of Human Rationality” (which sounds a lot drier than it actually is). This is the kind of book I keep where I can refer to it at a moment’s notice, because my only complaint (and it’s a valid one) is that while the strategies are extremely effective, and have helped me immensely – well, they don’t “stick” very well. Meaning, I have to review the insights regularly to keep the ideas fresh and applicable to my life. Still, it is a book I highly recommend. This is not a “check it out from the library” type read – you’ll definitely want to keep it on your shelf for reference. Don’t take my word for it, get a copy of it for yourself to find out how you can refuse to make yourself miserable about anything – yes, anything!